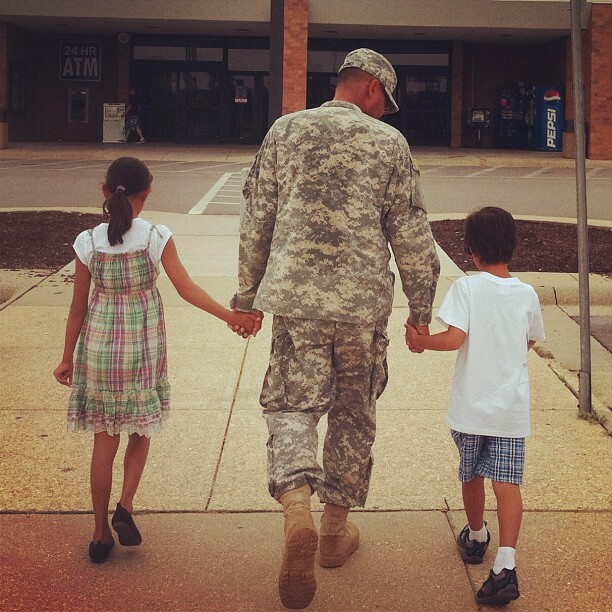 For those of you who've been following here for a long time, you probably already know we're a military family. We remember those we've lost on Memorial Day and give thanks for our active duty and veterans on Armed Forces Day and Veteran's Day. There's family history of military service on both sides, but our favorite soldier is the one who lives in our house. 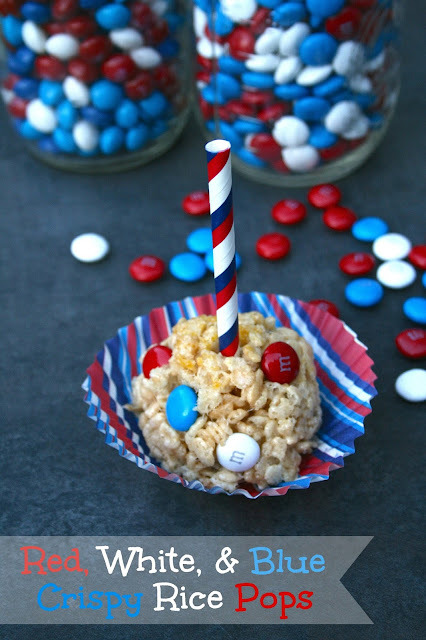 Did you know that M&M's® were originally created for soldiers? The candy coated shell prevented the chocolate from melting when carried by troops. They're still a perennial soldier favorite--my husband loves the mini bags to tuck in his uniform pockets for snacks on the go and I always made sure to send them when he was deployed since they held up in the mail! Currently, he's been home with us for over a year. Since I'm not currently sending deployment care packages, I've been enjoying some baking for the troops and sending food into his work. Over the years, I've learned that homemade baked goods make soldiers really happy and I always enjoy a chance to bake for a willing audience. It gives me taste testers whenever I need them and you can always find someone who will make the sacrifice and taste the new cookies or cakes! I also love baking with M&M's®, since they provide the perfect chocolate bite in recipes and they are released in holiday colors. This year, we're using M&M's® Red, White, & Blue Milk Chocolate to make the most adorable Crispy Rice Pops for the patriotic holidays. Every time you purchase a bag of M&M's® Red, White, & Blue Milk Chocolate (or M&M's® Red, White, & Blue Peanut or Skittles® Red, White, & Blue too) at Walmart, you are participating in the "1 For You, 1 For the Troops" campaign! 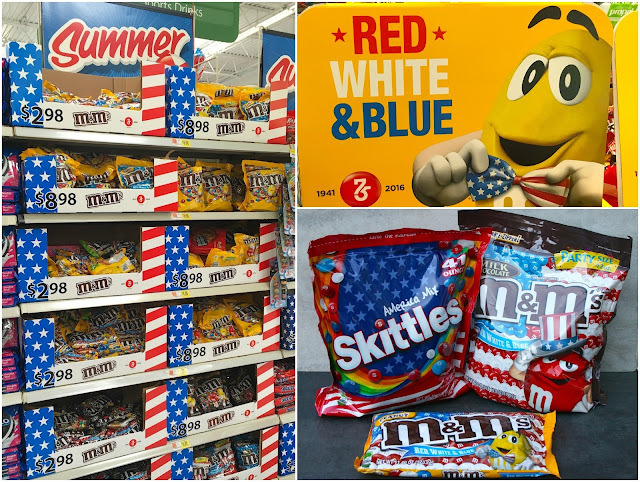 MARS/Wrigley is donating M&M's® to the troops for every bag purchased. It's an awesome way to say thank you. Through July, select stores will even have more information about the program. 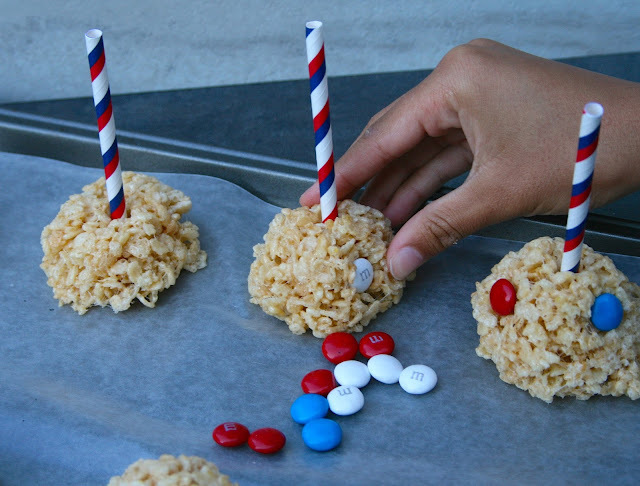 So once you buy your M&M's®, you should really do something fun with them! 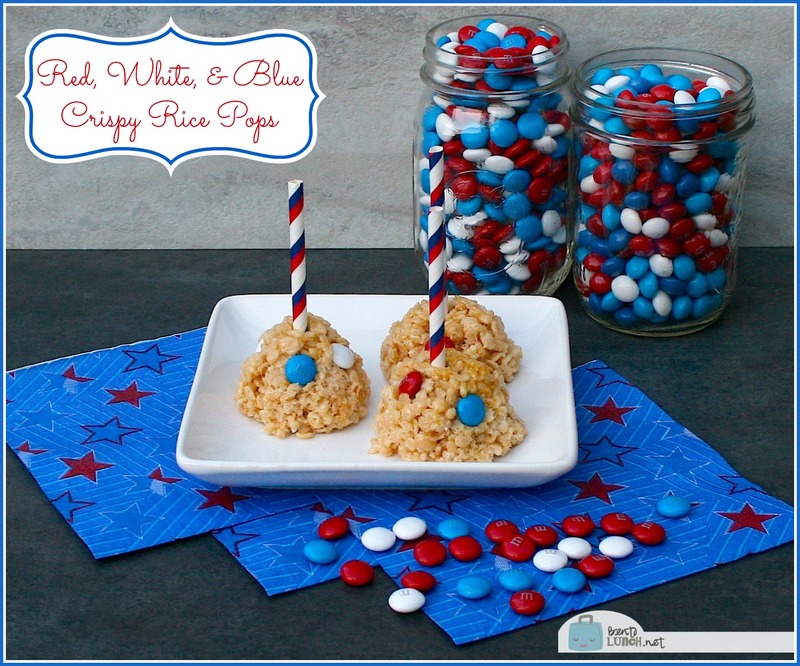 We recommend these crispy rice pops in fun patriotic colors! They look so cute on the table and they are perfectly portioned for a snack. Paper straws in matching colors, cut in half. 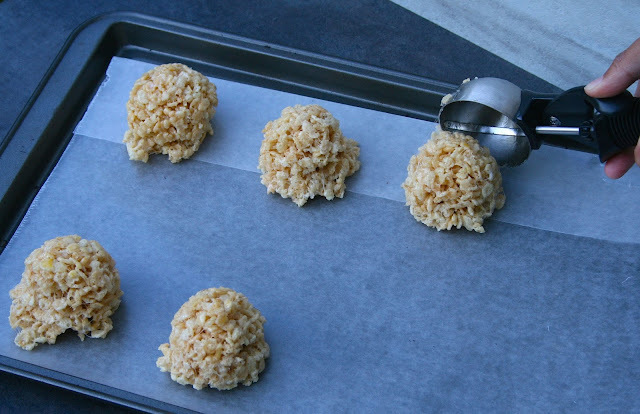 Measure out 6 cups of crispy rice cereal and place in a large bowl. Melt 4 tsp of butter over low heat. 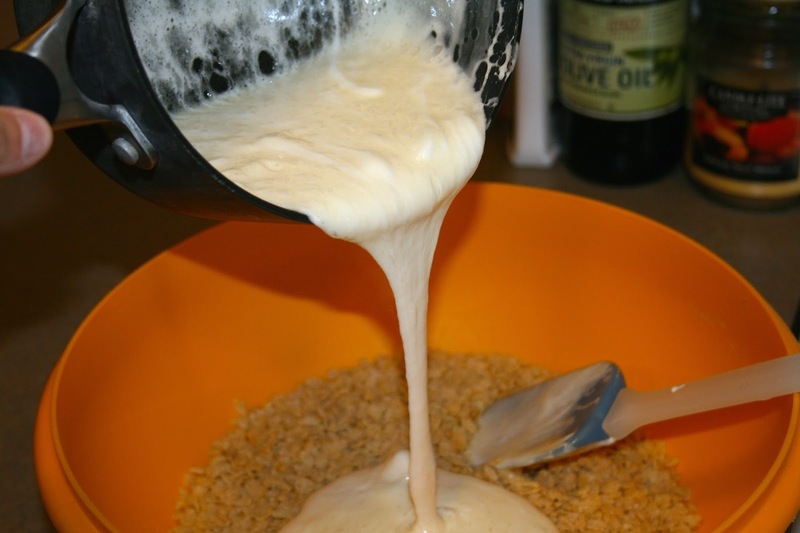 Stir in marshmallows and continue to cook until marshmallows melt into butter and form a thick liquid. Remove from heat and mix marshmallows into cereal. Using an ice cream scoop, form balls of cereal mixture, molding tight with your hands. Place on a wax paper covered cookie sheet. 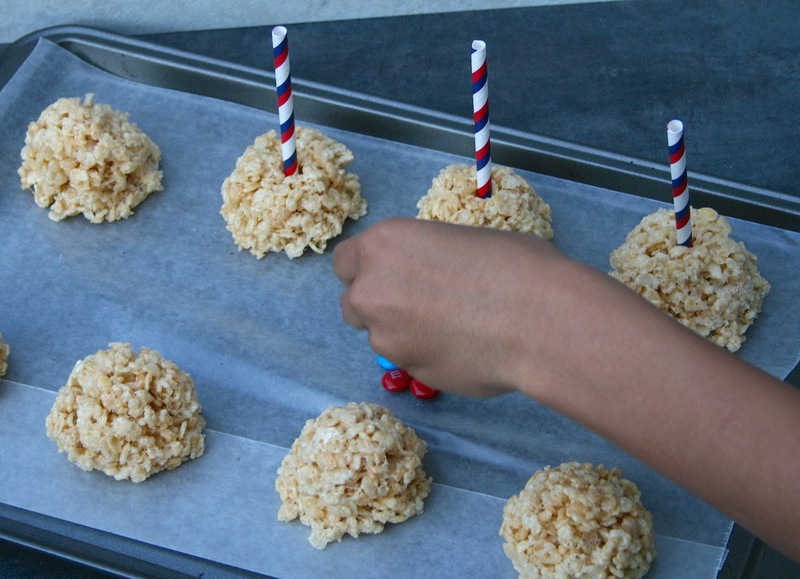 Cut paper straws in half and push straws into top center of each ball to make an inverted lollipop. Reform the ball shape if needed. Push M&M's® or Skittles® into the sides of each ball to decorate. 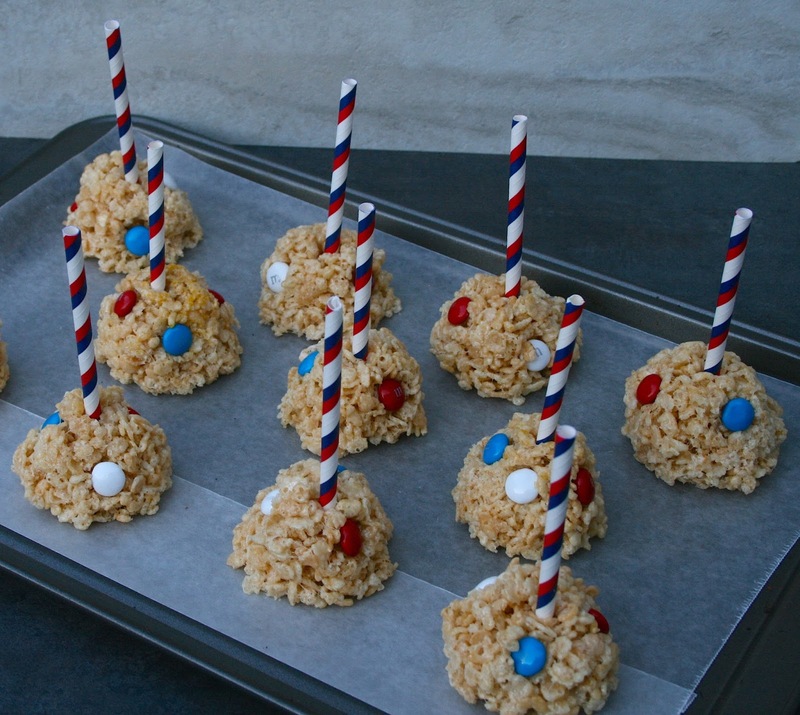 If you need to, you can push the crispy rice around the candies to hold them in place. Let set and harden, then serve! We placed ours in paper muffin cups to add color and prevent them from sticking to the tray. 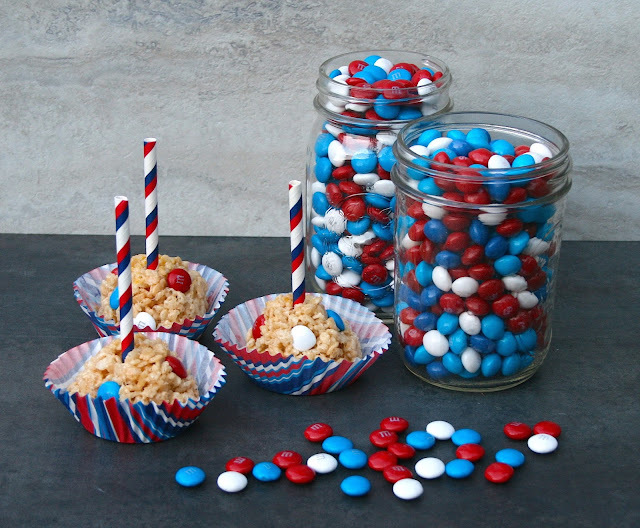 What else would you make with the M&M's® Red, White, & Blue Milk Chocolate? Check out My Confection Corner for more amazing ideas! Want to pin this post? Just click here or on the image below!